I have long wanted to write this post, but somehow my hands did not reach. 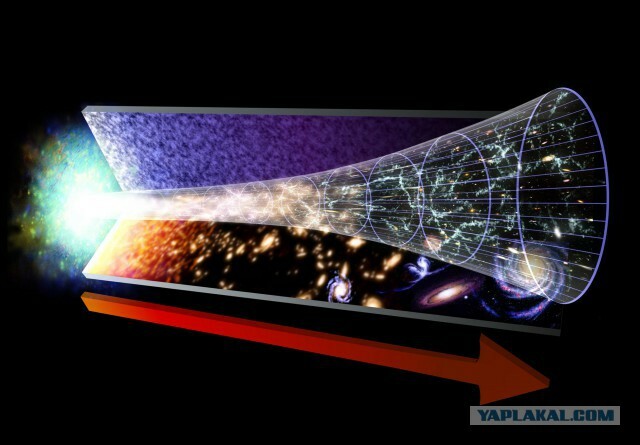 Big Bang and the stage of inflation. I will not dwell now on the fact that the big bang is not a bang at all, and it didn’t happen at a point, but everywhere, and it was far from the first stage of the universe’s evolution. Before the big bang there was a stage of inflation, it did not last very long, and at that stage there was still no matter in the universe. Just the space-time itself under the action of a certain field began to expand rapidly, much faster than the speed of light, or rather exponentially. And then, having expanded all this energy, the so-called inflaton field was transformed into matter, as the cosmologists say made a phase transition. And it is from this moment that the big bang begins. Those. matter appears, expands and cools.